we eat with our eyes first. Your customers are seeking out their options online, and making decisions on where to spend their hard-earned cash before their feet hit the pavement. Your online presence is your first opportunity to make an impression. The old cliché still holds true: a picture is worth a thousand words. Shouldn’t yours have the edge over your competitors? Google Business View lets your customers feast their eyes on your business before they set foot through your door. Google Search listings that feature images – especially stunning professional photography like ours – are statistically proven to attract more eyeballs and invite more click- throughs to your website. Your website is the virtual welcome mat to your business. Let’s get them knocking at your door. 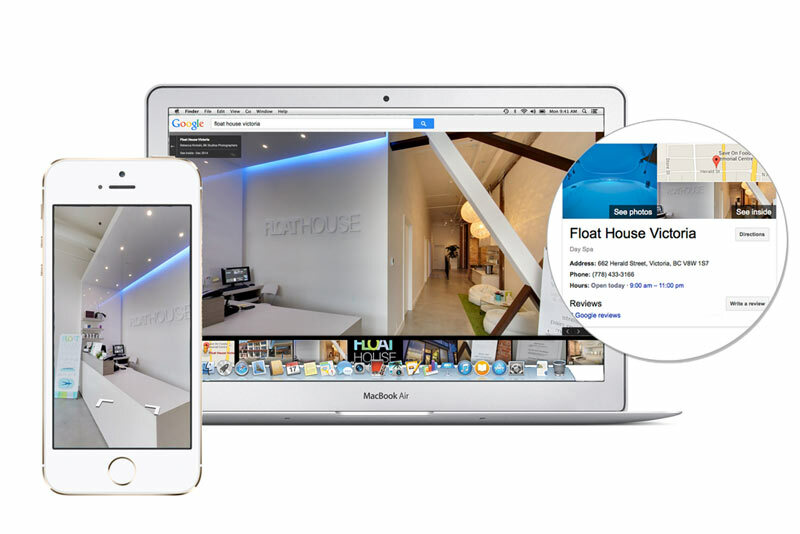 Google Business View gets you noticed – in Google Search, Google Maps, Google Ads and Google+. BK Studios is an accredited Google Trusted Photographer that specializes in creating the eye candy that lures your customers in. What is Google Business View and what will it do for my business? You have used Google Street View to “get a feel” for a neighbourhood you have never visited before. Google Business View uses the same Street View technology to give your customers a 360 degree visual tour of your business. Professional panoramic images enable your customers to preview the experience they will have in your location(s) and fast-track their decision to choose YOU. Anyone with computer, tablet or smart phone will be able to virtually walk directly off Google Maps or Google Street View and into your business. All Google Map technologies seamlessly integrate with one another on all platforms. You can easily embed Google Business View and the supporting photography into your current website and raise the bar of your visual brand at the same time. Google Business View enables you to feature innovative business photography to not only showcase your store front and interiors, but to optimize your presence on Google search, Google Ads, Google Maps and Google+. Google Analytics, the industry standard for monitoring and measuring the effectiveness of your website content, works hand-in-hand with Google Business View. Now your website imagery can be one more element to track how your customers are interacting with your site. Getting your business listed on Google Business View is smart, simple, fast and effective. Google Business View is the most affordable and measurable tool your marketing budget can buy. 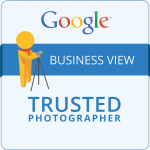 Only Google Trusted Photographers can submit photography to be used in Google Business View. Google certified photographers must undergo specific training and follow meticulous guidelines to provide you with the best quality virtual tour & feature images of your business. Rebecca Kirstein of BK Studios is one an elite few in Victoria, BC to achieve certification as a Google Trusted Photographer. We have built our business as the top business portrait photographers in Victoria, BC. We believe that everyone deserves professional headshots no matter what size your budget, and we offer a range of photography packages. Check out our portfolio featuring small business owners, corporate teams, local celebrities and community leaders. By adding recognition as Google Trusted Photographers, we can offer even more innovative options to give your business the edge. We specialize in offering a full spectrum of innovative business photography services that can be added to your virtual tour. You can finally get the stand-out professional photography your website has desperately needed, and package them with your Google Business View images to save time and money. Contact us to schedule a shoot at a time that is convenient for you. We will arrive on time, and will take about 1-2 hours to capture your 360 degree tour and feature images of your business. We can also schedule your business portraits or product photography to save you time, money and further interruption to your busy schedule. We take care of the rest, including photo editing and submitting your images to Google. The results are live on Google Maps Business View in just a few weeks. We also ensure that Google Business View is embedded onto your website with the Google Maps API or simple HTML. Other than that, you don’t have to do a thing (except maybe prep your business to receive the onslaught of new customers). complete setup, editing and upload to Google Maps. Please note: All prices listed above are a one-time fee, and your business will be permanently featured on Google. From time to time you'll also recieve our latest news, special offers and other exclusive offers.